Since 1995, the Chesapeake Orchestra, under the direction of Jeffrey Silberschlag, has provided world-class professional music to over 400,000 appreciative people in Southern Maryland. In 1999, the Chesapeake Orchestra took up residency at St. Mary’s College of Maryland at the River Concert Series. Over the past 13 years, the River Concert Series has become the cultural and tourist destination for Southern Maryland, winning the Governor’s Tourism Impact Award. 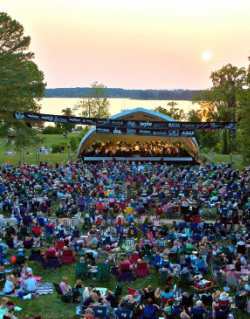 It was noted in a recent article that concerts performed by the Chesapeake Orchestra have brought this community together, as about 5,000 people come every Friday evening from mid-June to the end of July to enjoy orchestral concerts that offer programs whose musical themes are designed to reach the broadest possible audience. The repertoire ranges from serious classical composition, to light classics, to jazz and genres such as bluegrass and blues are fused with orchestral instrumentation to develop new audiences. Some featured popular guest artists have included the Ahn Trio, country star, Suzy Boggus, Broadway star Kate Baldwin, jazz vocalist Hilary Kole, or jazz musician Terence Blanchard. Building on the success of the River Concert Series, the Chesapeake Orchestra will partner with other venues in Southern Maryland to develop residency projects that will provide communities with high-quality professional programs that will enhance their culture, quality of life, and economic development. These programs can include everything from a music festival, to a small concert series, to individual a concerts, to providing schools with music master classes, workshops, or chamber music, offering an orchestral residency in a community. Such sites in Southern Maryland may include the National Harbor, Leonardtown, Maryland, Sotterley Plantation, Bowie State University, Blue Crab Stadium, College of Southern Maryland (CSM) Campuses in La Plata, Prince Frederick, and Leonardtown. Other sites along the Potomac River in Virginia could include Mount Vernon, and Dahlgren in King George, County. The concept would be a turnkey cultural destination that would also enhance tourism and make the community a cultural hotspot. The Chesapeake Orchestra in Residence would expand the current season by developing other residencies and help other communities to become a destination for culture and tourism. The Chesapeake Orchestra in Residence would engage in contracts with various communities to provide the type of program that suits their location. Chesapeake Orchestra, Inc. under the direction of Jeffrey Silberschlag provides Southern Maryland with high-quality cultural programming for all ages with broad-based appeal; and creates residencies for the orchestra with programs at several venues in welcoming environments in this region for the enhancement of quality of life issues and increasing tourism. The performances range from serious classical composition, to light classics, to jazz, and genres such as Bluegrass and Blues are fused with orchestral instrumentation to develop new audiences. Nationally and internationally prominent artists and bright new talents fill the roles of soloists and narrators. The orchestra’s presence will enhance the internationalization of Southern Maryland with cultural exchanges that includes the creation of business opportunities and increased tourism.